I suffered an attack of Transverse Myelitis (TM) in the summer of 2001. The result of TM left me with various neurological problems in the spine, including the inability to walk without mechanical aids. Continuous physical therapy since that time has helped greatly. Progress has been measured in terms of small changes in distance walked, or weight lifted. Such changes accrue over time and results are achieved. However, I have never undertaken a new physical activity since the onset of TM. I certainly would not have guessed horse back riding to be a possible new activity! And without instructors trained in therapeutic riding, it would not be. I am lucky to have someone who understands my short term limitations and how to move past those obstacles in a safe manner. Equine Therapy is more than just “riding a horse”. I had never ridden a horse before, so having someone capable of teaching me to relax during that first lesson was crucial. 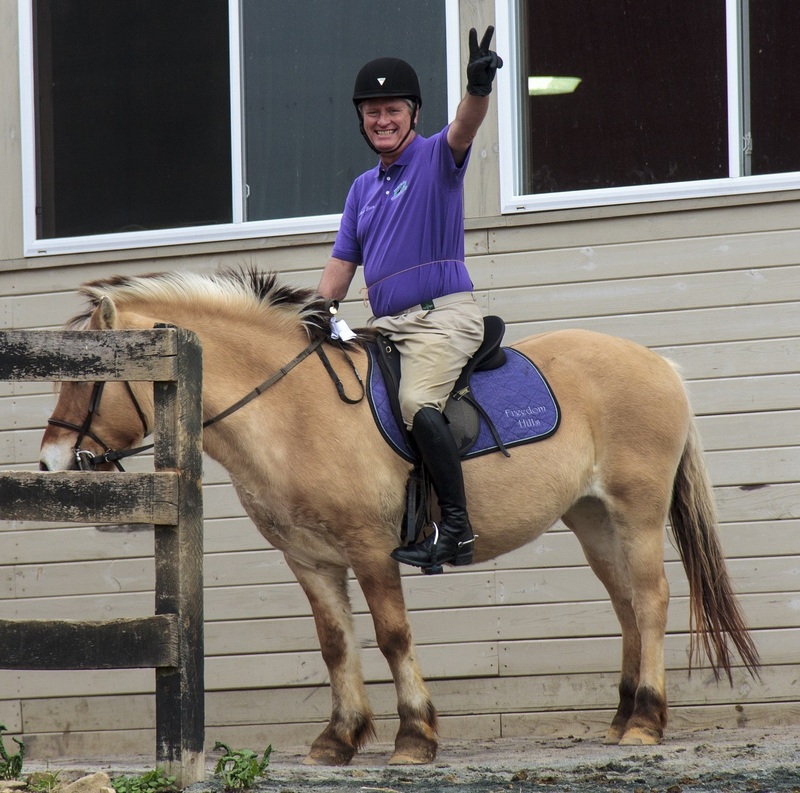 It was not until a few lessons later that I learned just how important a relaxed, balanced position when riding is so very important. I am glad I started learning proper form at the outset. One of the results of TM is increased muscle tone – stiffness of the muscles. A properly trained rider will learn to obtain a feeling of balance by relaxing the eyes, neck, shoulders, hips, and ankles. I can feel the muscles loosening and working with the horse when riding. I am learning to apply these skills to everyday activities such as walking and am starting to see results. It is rare to see a therapy provide results so quickly, but few therapies work in the same fashion. My physical therapist has flatly refused to provide hour-long piggy back rides! Perhaps this is why he too endorses equine facilitated therapy. No one can predict the complete benefits I will receive from riding, however the results I have already received and excitement of meeting a new challenge make equine therapy very worthwhile.